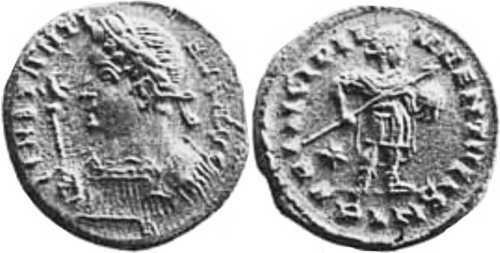 CONSTANTI-NVSAVG [CONSTANTINVS AVG] [1f]; bust l., laur., cuir., holding eagle-tipped sceptre. PRINCIPII-VVENTVTIS [PRINCIPI IVVENTVTIS]; prince stg. facing, head r., in military dress, cloak hanging behind, r. holding transverse spear, l. globe. Star in left field. PLN in exergue. UNLISTED OBVERSE LEGEND - 1f. Not attested for this reverse type (p. 139). Bust similar to type Q from Group III, (iv), p. 134). Could be also regarded as mantle (see CORRIGENDA, VOL. VI, p. 134). Not listed in Huvelin. Listed in Cloke-Toone (7.11.013). Should be listed in RIC after LONDINIUM 268. Weight 4.21 g. From William Sharp Ogden, "A find of Roman bronze coins on the Little Orme's Head, North Wales. Supplement no. 2", British Numismatic Journal 1912, p. 84 and plate V, no. 5 (bust described as "with pallium").